During the 18th and 19th Centuries the Germans, and it must be said their British and French counterparts, wandered about the globe finding ancient stuff and, er, taking it home. The result is that Berlin is full of museums and those museums are full of an amazing treasure trove of historical items. 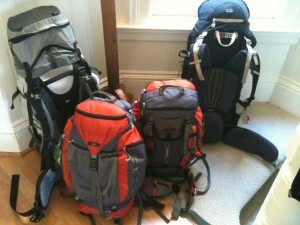 We’ve discussed the ethics of this sort of acquisition in the past and our family jury remains out. Sam, our tour guide in Egypt, had in an earlier life been part of a group lobbying the French to return some of their looted items. Seeing the pain it caused him to have crucial parts of his heritage in someone else’s hands gave an immediacy to the issue. That said, there’s no question there’s a strong argument that the only reason some of the items are so well-preserved is that they were taken and looked after. Probably the most telling argument for us has been seeing some of the exhibits in the Egyptian Museum in Cairo being cleaned. These were items from Tutankhamen’s tomb kept in glass cases, and rather than a careful conservator in action there was a security guard with a cigarette and a feather duster. It didn’t inspire much confidence. In contrast the items in Berlin, and those we’ve seen in the British Museum, are carefully looked after and beautifully presented. It’s a lovely tricky question for dinner-time conversation with the kids. Regardless of the ethics, having so many items within walking distance makes for some simple historical sightseeing. We had an enjoyable day visiting three of Berlin’s main museums: the Pergamon, the Neues and the Altes. They all sit on an island in the river and form a gorgeous complex. Visiting the Museums was particularly enjoyable because it allowed us to put some perspective on some of the things we’d seen earlier on the trip. It was great seeing the boys join the dots between places they’d been and what was presented in the Museums. Here there was a temple reminiscent of Petra; there stones from just outside Amman in Jordan; here a panelled room from Aleppo from the same place and time as the Aleppo Codex we’d seen in Jerusalem. Both boys now have a thoroughly in-depth knowledge of Egyptian, Greek and Roman gods – far better than Jennifer’s or mine. 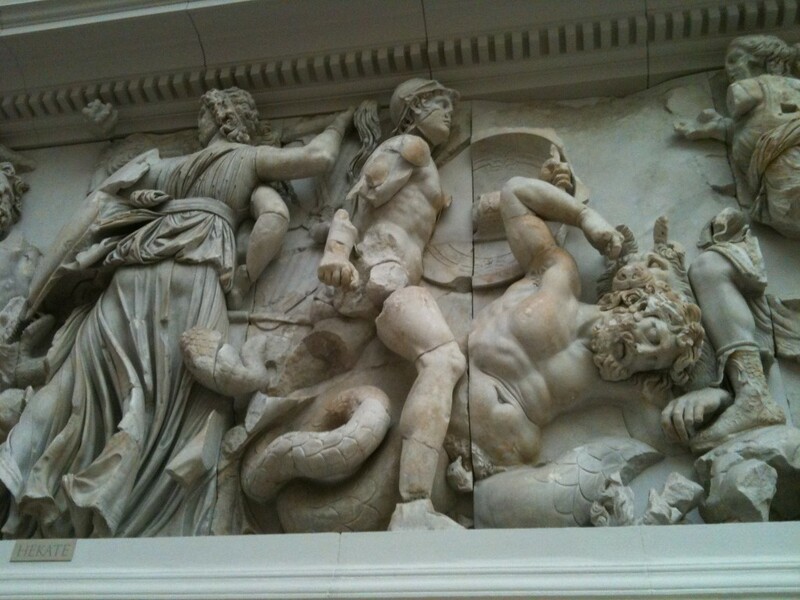 As the centre-piece of the Pergamon is a huge frieze of the gods, the boys were extremely handy to have about. We also came away with an understanding of the various types of columns – doric, ionian, corinthian – that we decided to label ‘schoolwork’ for the day. Our favourite items were busts of Nefertiti and Julius Caesar. No great surprise as they are the most famous exhibits. 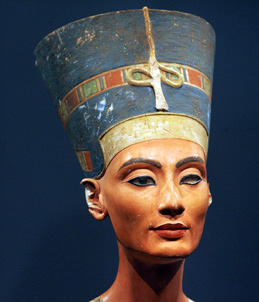 The Nefertiti bust in particular was just an astonishing example of fine workmanship – if you even slightly close your eyes it looks like she’s alive. A little thing that worried us when we visited the Egyptian Museum was a couple of the guard statues from Tutankhamun’s tomb which had faced each other for millennia were presented facing away from each other. In contrast the Neue Museum has carefully placed Nefertiti so her gaze travels the length of a long corridor to rest on a statue of the sun God. Meaningless at one level, but I like the fact the Museum made the effort.